Genocide, mass murder and human rights abuses are arguably the most perplexing and deeply troubling aspects of recent world history. This collection of essays by leading international experts offers an up-to-date, comprehensive history and analyses of multiple cases of genocide and genocidal acts, with a focus on the twentieth century. The book contains studies of the Armenian genocide, the victims of Stalinist terror, the Holocaust, and Imperial Japan. Several authors explore colonialism and address the fate of the indigenous peoples in Africa, North America, and Australia. As well, there is extensive coverage of the post-1945 period, including the atrocities in the former Yugoslavia, Bali, Cambodia, Ethiopia, Rwanda, East Timor, and Guatemala. The book emphasizes the importance of comparative analysis and theoretical discussion, and it raises new questions about the difficult challenges for modernity constituted by genocide and other mass crimes. Conclusions: 18. 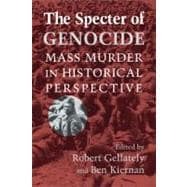 The specter of genocide Robert Gellately and Ben Kiernan.